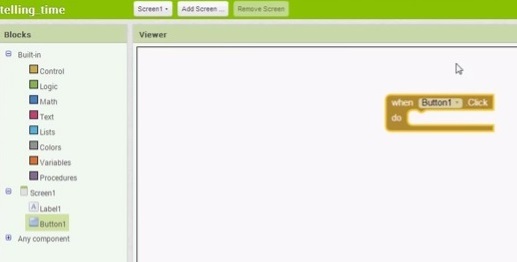 This tutorial is intended to show you how to create your own personal Android app that is capable of displaying the real time in hours, minutes, and seconds. This Android app will be capable of displaying the time stamp in your Ubidots account. Every time you press the button in your android app, your Ubidots time stamp will show, in real-time. Log into your Ubidots account or sign up for a Free Educational License here. NOTE 2: The creator of the video in step 3 named his parameters temperature, humidity, and air flow, but you are not dealing with such parameters in this tutorial. Let's name only one parameter, "time" as that is our focus. As for the device, you can name it whatever you like, i.e. "time-teller." Click on "create apps!" to the right hand side. Click on "start new project" on the left hand side. Title it to your liking, i.e. 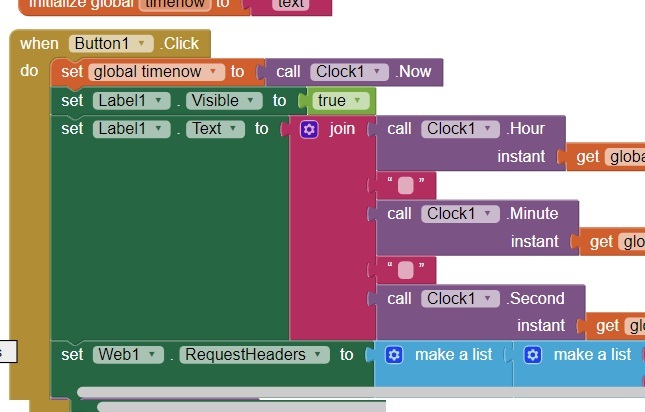 "time-telling app." Click on the project and we're ready to start building our time stamp! Under the category "connectivity" in the palette, click and drag the web icon over to the center screen. 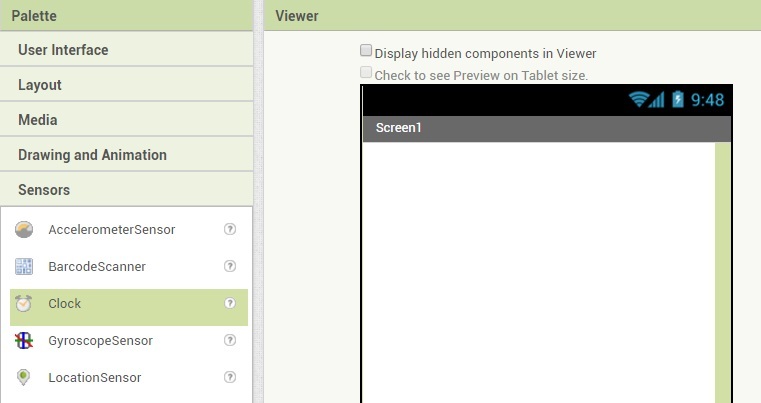 You will now see the "web" icon under the category "components" in the right pane of the screen. 2. Clicking the "web" icon under "components" will reveal the component's "Properties." 4. Replace the words "your-device" with the exact name of your device that you named while you were following the YouTube video previously. If you've forgotten, go back to your Ubidots account and it can be found within the device's details. 5. Replace the word "TOKEN" (the very last part of the above URL) with your Ubidots token. Can't find your token, check out this simple guide. 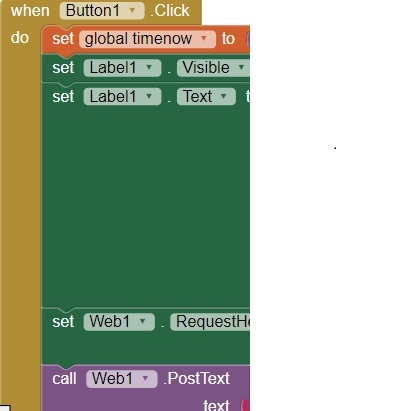 Under the category "sensors" in the Palette, click and drag the "clock" icon to the center screen. 2. 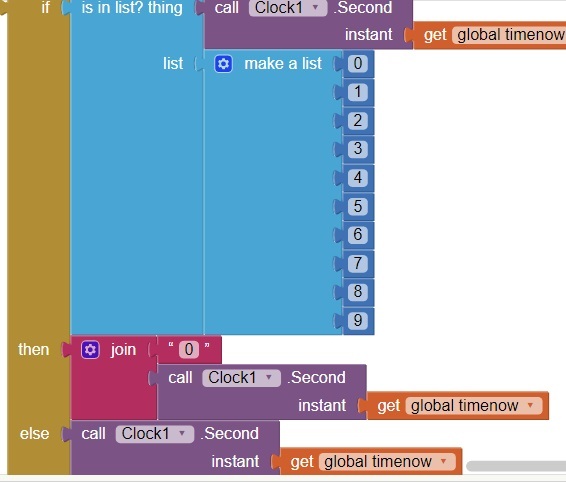 In the "components" category, click the "clock" icon to display "properties"
4. 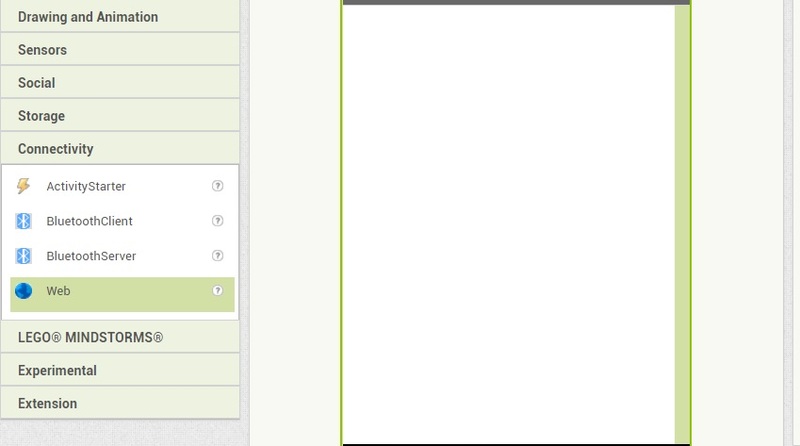 From the category "user interface" in the Palette, click and drag the "button" icon to the center screen. 5. Click on the button icon "Text for Button1" on the middle of the screen , and the "properties" will appear. 6. In the box labeled "Text" name your button. For example, name it "Tell Time". 7. From the category "user interface" in the Palette, click and drag the "label" icon to the center screen. 8. 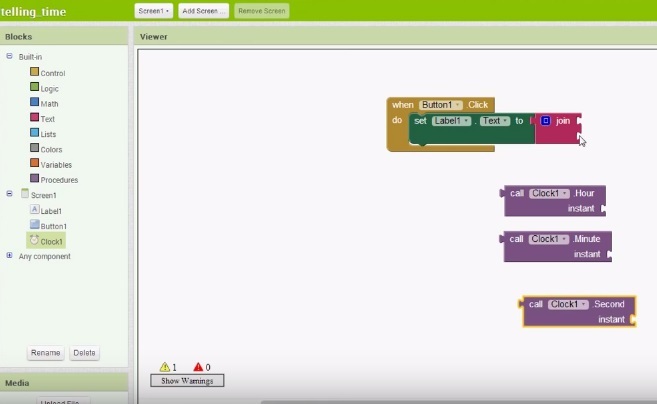 In your center screen, click the label icon "Text for Label1" and again the "properties" will appear on the right. 9. Check the box for "FontBold"
10. Make this Label hidden (under "visible"). Now we are ready to build the time stamp app! 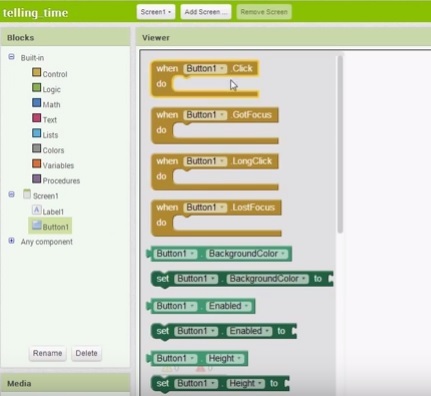 In the MIT App Builder, using the "Blocks" tab in the upper left hand side. 3. 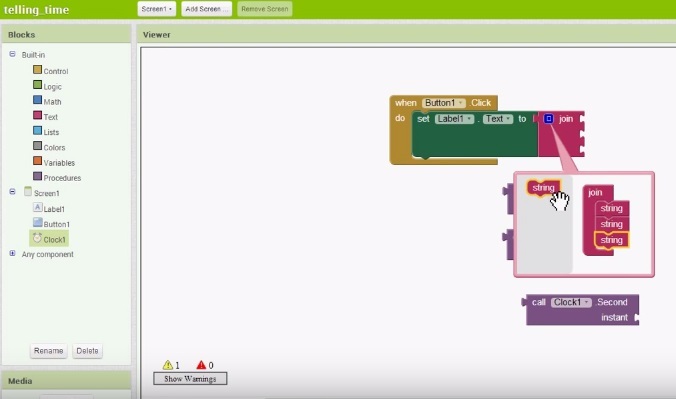 Click and drag the first building block (when, Button1, click, do). 6. Click on the "Clock1" icon. We need three building blocks from here: call, Clock1, hour, instant... call, Clock1, minute, instant... and call, Clock1, second, instant. 7. 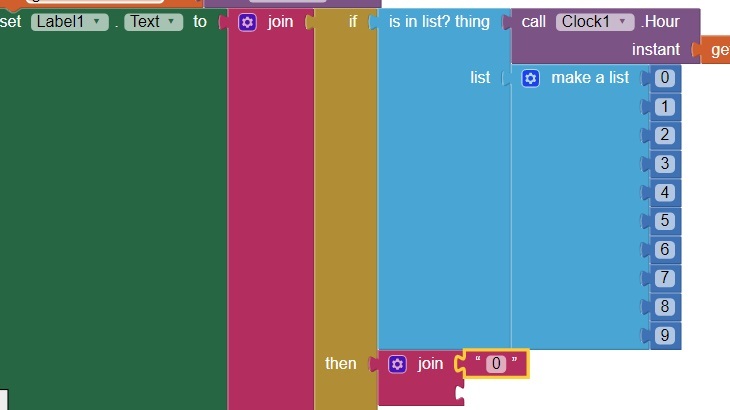 Next, click on the blue symbol located on the pink building block that says "Join." 8. We need this block to have 6 nodes instead of just 2. To do that, click and drag the single mini building block that says "string" and place it under the other mini building blocks. 11. Next, click "Variables," select the building block that says... initialize, global, name, to... and change the name to whatever is appropriate. Let's call it "timenow"
12. 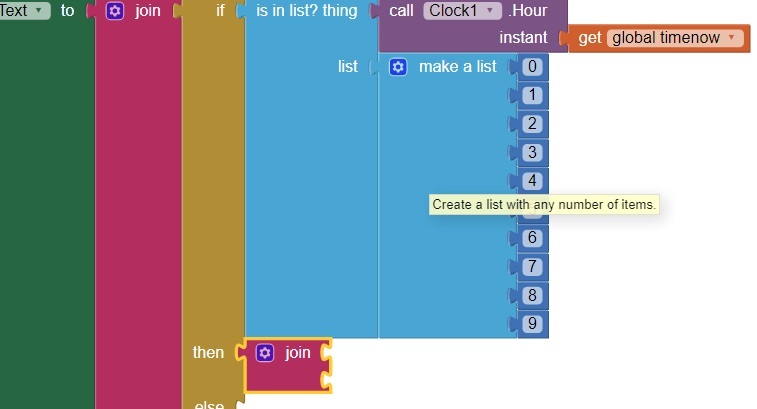 Under "Text", take the first building block again, and connect it to the previous. In it, type in "text"
13. 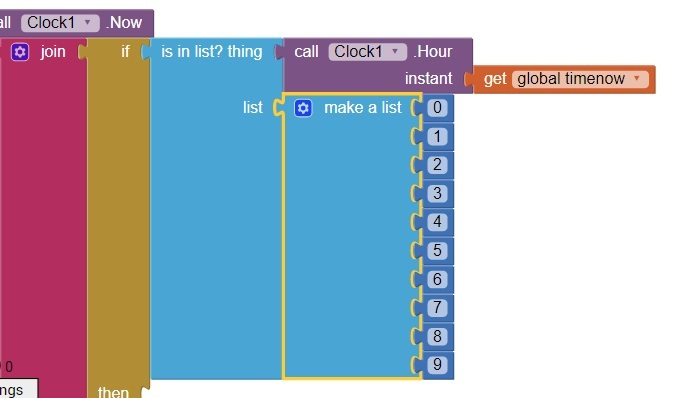 Under "Variables," select the second building block (the one that says "get") and attach it to the clock building block "call, Clock1, hour, instant"
Congratulations! You have built the foundation for telling time. But, before we proceed, let's add the necessary components to this foundation to ensure connectivity to Ubidots. The YouTube video to begin this tutorial showed how to fill out the HTTP request webpage, using the Ubidots documentation webpage. What was done here was prepare the Ubidots cloud for receiving an HTTP request. Now, in order to receive an HTTP request, Ubidots needs a device (like this MIT app converter) to send one! Once you've added the necessary building blocks to send HTTP request, you will be able to see how the JSON dictionary syntax above is implemented into our foundation. 4. Click on the "web" icon, and select the building block called... call, Web1, PostText.... and place it at the bottom of our foundation. 5. Using similar building blocks that you have already used, the rest of this foundation is as follows. Make sure to type in the seconds, minutes, and hour text blocks exactly as you see them, so that they could exactly match the JSON dictionary syntax! Now, rather than a single numerical value for time, we need to assign some structure to make it easily readable. We must add colons to separate the hours, minutes, and seconds, and we must also make sure that each of these segments--hours, minutes, and seconds-- always has two digits. For example, if it is 5 minutes and 7 seconds past noon, 12:05:07 looks more pleasing to the eye than 12557. 2. Under "Blocks" click on "Control," and take the building block that says if, then, else on it, and place it above the first colon. 3. 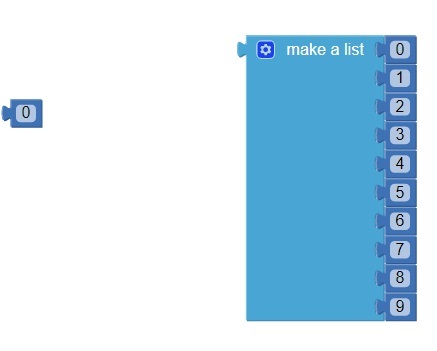 Under "Blocks" click on "Lists" then choose the building block that is is in list?thing, list an connect it to the "if" node of the building block you put down in the previous step. 4. 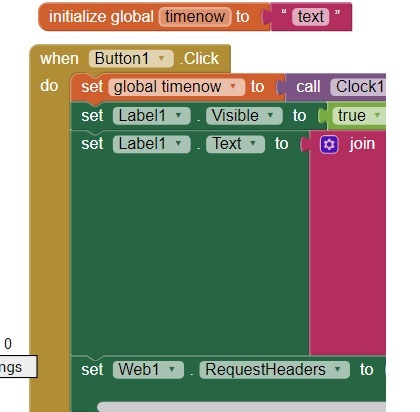 Connect the clock building block....call, Clock1, hour, instant.... along with its attached block "get global timenow" to the "thing" node of the building block you put down in the previous step. 10. 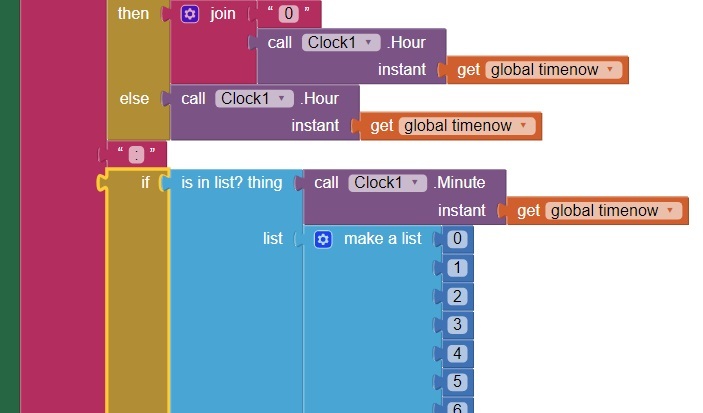 Take the clock building block "call, Clock1, hour, instant" along with its attached block "get global timenow" and connect it to the "else" node of the "if, then, else" block." 11. Steps 1-10 need to be repeated exactly the same way, this time replacing the "call, clock1, hour, instant" block with the "call, clock1, minutes, instant" block. 12. Steps 1-10 need to be repeated exactly the same way, this time replacing the "call, clock1, hour, instant" block with the "call, clock1, second, instant" block. 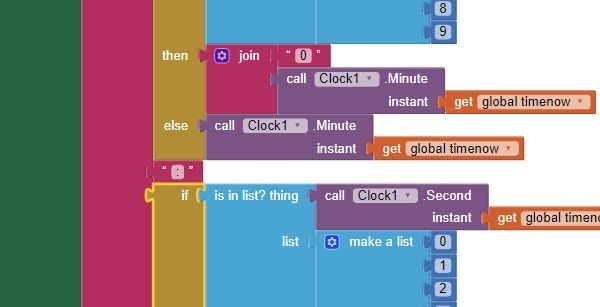 I recommend simply right clicking on the "if, then, else" block, duplicating it, and simply replacing the two clock blocks mentioned. 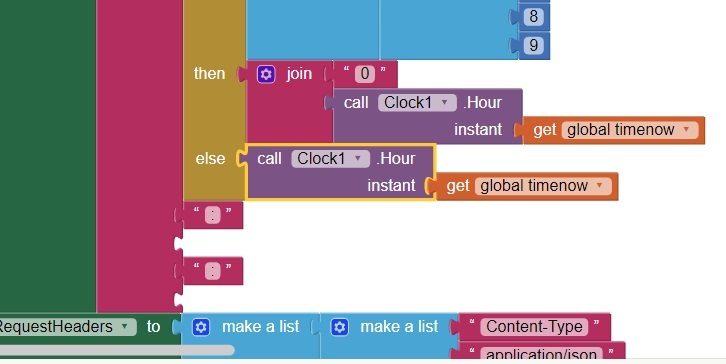 Then connect it to the node that comes after the second colon after duplicating and replacing the clock blocks with "call, Clock1, second, instant" instead of "call, Clock1, hour, instant"
Our code is officially done and you have the complete building blocks to your time stamp application. 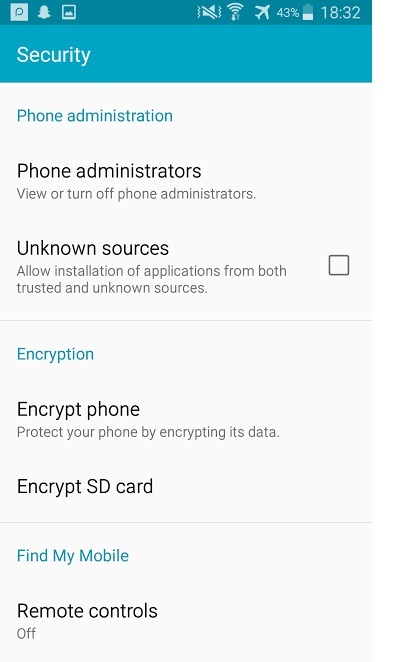 Using your Android phone, go to the Playstore and download "MIT AI2 Companion." 4. 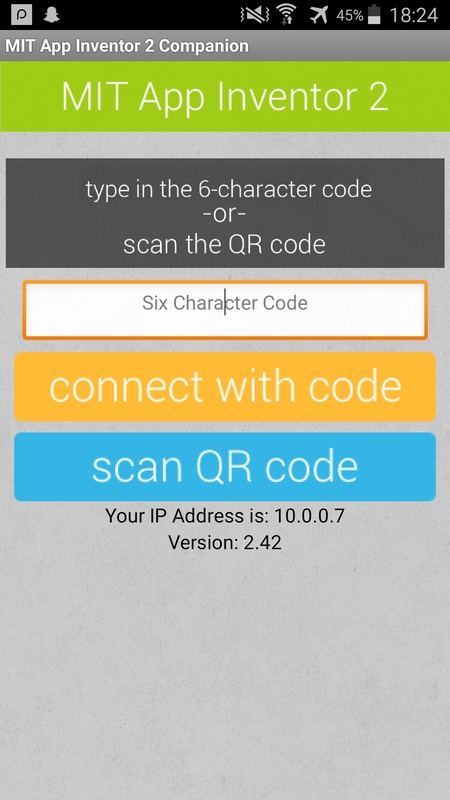 In the app of your phone, click on "scan QR code" and take a picture of the barcode. 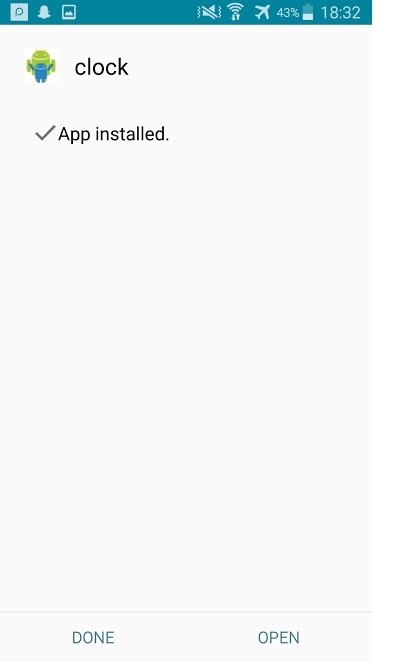 Your phone should automatically start installing another app, which is your app that you've created within this tutorial! 5. No reason to worry. 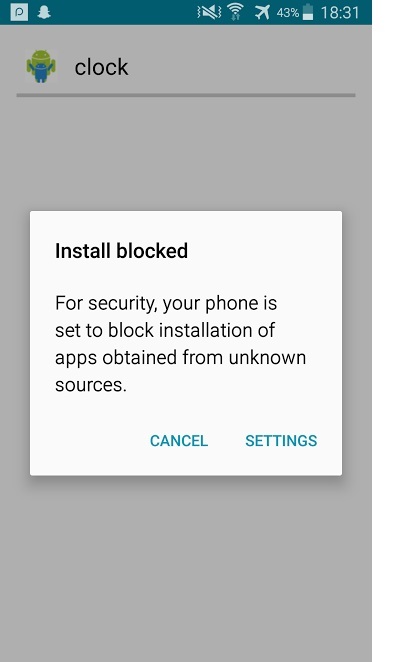 Click on "settings," check the box named "Unknown sources" and "OK."
Your phone is now installing your app! 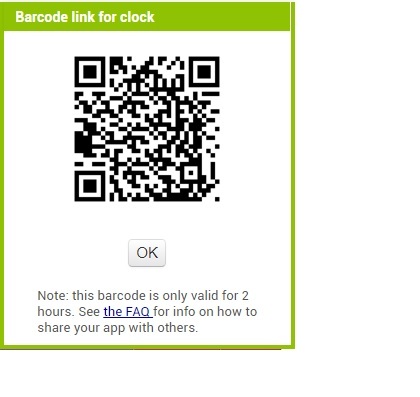 Our app is called "clock" as this is the device-label used when filling out the HTTP request page. As you can see in this example, the time displayed is 18:23:05, or 18 o'clock, 23 minutes, and 5 seconds (6:23 PM and 5 seconds). If you go to your Ubidots page under the "Devices" tab, you will see that whenever pressing the button in your app the variables in Ubidots (hours, minutes, seconds) update immediately. 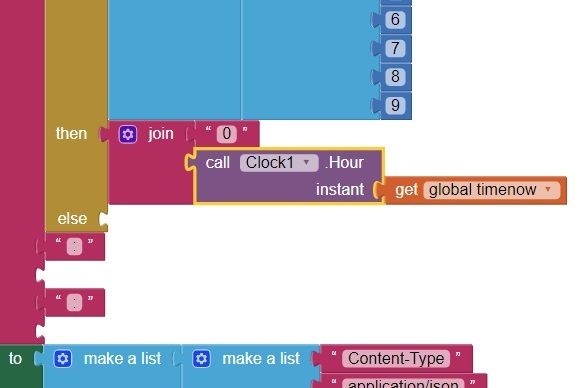 The creative mind can only go so far without the help of technical knowledge, but the app inventor stretches the boundaries of what we can accomplish. 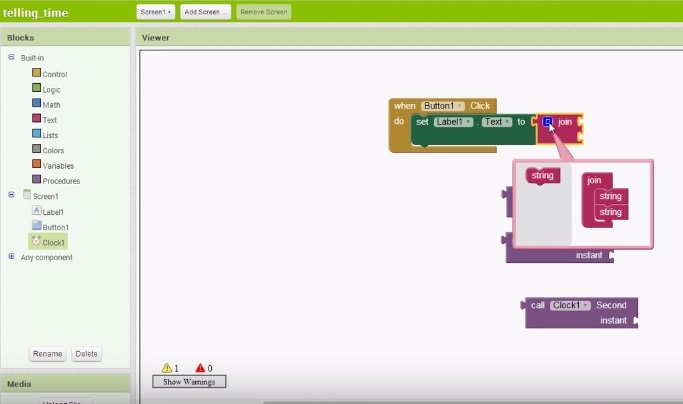 Telling time is only a simple, small example of what you can do with the app inventor, but when paired with Ubidots, one is capable of rapid development. There's the cliche that "technology makes our lives easier", and this is also true with the Internet of Things. Only the difference being IoT makes an individual's life easier. The IoT allows users to explore their own niche and improve their own environments. To begin your innovation and IoT development, create a Free Ubidots account today and begin your betterment.